Use this as a craft you can hang in your window. There is an option at the bottom for younger kids, instead of melting crayons. Optional: Print the template at the bottom of this page and slide it under the waxed paper as a rough guide for filling the apple shape. take the paper off some crayons and 'sharpen' them in the pencil sharpener. Let the shavings drop onto 1/2 the waxed paper. When you have a few nice piles of yellow, green or red shavings refold the waxed paper. (or whatever color your child wants to use for their apple). Iron for about 10 seconds. Peek and iron a bit more if necessary. All the wax should melt. The longer you iron, the more your colors will mix. Let sit about 30 seconds to cool. Stack two pieces of construction paper. Fold in half. Cut out a half apple shape. You can do this freehand, use the template as a guide or draw it on for small children to cut out. The shape can be as simple as a circle with a small stem on top or you can try to make it look a bit more 'apple-y' by making the top of the circle a bit wider. You can also add a leaf by unfolding your apple and cutting a leaf on one side of the stem. 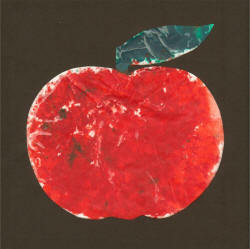 Unfold the construction paper and you'll have two pieces of paper with matching apples in the middle of them. Put glue around one of the pieces of construction paper. Put your waxed paper ("stained glass") onto the middle of the page. Put glue on the second piece of construction paper and lay it over top of the first so the 'stained glass' is sandwiched between the construction paper and the circle shapes are lined up. "I have done for this to make it more suitable for younger kids. Instead of using wax paper and melting crayons..."
Use clear contact paper and tissue paper pieces. You can use purchased contact paper or you can 'make your own' by spreading a thin layer of glue onto waxed paper.